Please select a date of play to check availability on Vila Sol. The Vila Sol 27 holes have been laid out as three circuits. The nine Prime Holes - The very first hole is a Par-4 with 381 metres which gives an idea of the general length of most holes. The next Par 4 is 407 metres and they later increase to 494 metres and 499 metres. Even the Par 3s are not under 180 metres. The nine Challenge Holes - This group of nine holes are mostly shorter, the Par 3s down to 159 metres, the Par 4s down to 313 metres, and the Par 5s down to 456 metres. The nine Prestige Holes - The back nine has two very attractive Par 3s down to 144 metres, the Par 4s down to 297 metres, but the Par 5s up to 519 metres. Vila Sol, 9 holes closed! 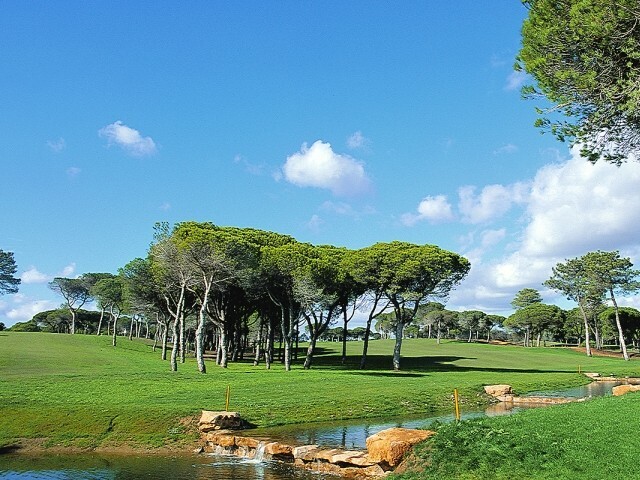 Great Course, a very traditional Portuguese course with fairways lined by Umbrella Pine Trees. We could only play the front nine of the Championship course and the 'Primo' 9 because the back nine of the Championship course was closed for maintenance, which really just looked like a rest as there was no visible maintenance taking place! This was disappointing and we had no prior notice of this being the case, despite the front 9 having been closed for at least 2 weeks before we got there, so not great from Algarve.net. the Primo 9 is a good and enjoyable walk but not as challenging as the Champ course. It wasn't a particularly challenging course as long as you keep to the fairways. Cow grass rough and loads of trees so stay clear if you can. We started on hole 19 as 1 -9 was closed for maintenance. Chockers when we went back to hole 10 for our cross over. Some fairways weren't in the best condition. Overall, did not enjoy as much as other Pestana courses due to slow play in front and tailgating golfers behind. A challenging course and in good condition, however I have now played here twice and on both occasions very slow pace of play! Round took over 5 and a half hours. Also one player in our group had to pay full price due to a late decision to play (the rest of the group got summer special deals) however we were disappointed that at least half of the tee boxes were forward off the red tees. Good course but completely disorganised no proper organised starter took 5.5 hrs to play 18 holes. Then got to the 16th and a 3 ball had cut in (is this what you expect for 80 euros a round? Maybe that’s ok for a run down municipal but not what you’d expect for a top course on the Algarve?) in summary course ok golf management leaves a lot to be desired. To post a review, score or a notice on Vila Sol page's or to connect with other Vila Sol golfers, please log in to your account or sign up using Google or Facebook.